Join us for a poster making workshop on Princess Royal Drive between the Civic Centre and Living Arts Centre as part of the City of Mississauga' Canada Day programming! 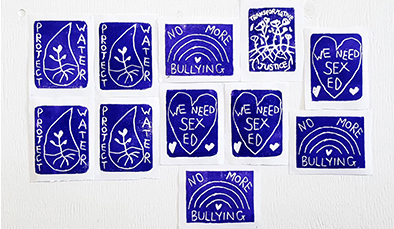 In this artist led workshop participants will make posters to create awareness and spark activism around important issues in their community. Presented in conjunction with the Art Gallery of Mississauga's exhibition In Case of Emergency and in partnership with Mississauga Celebration Square. Please note: The AGM will be open from 12 - 4 PM for regular weekend hours on Sunday, July 1 (CANADA DAY). Make some posters and then come check out our summer exhibitions!